The liberal firefighter union leaders are back with round 2 of musty attacks on Rudy Giuliani. The liberal firefighters already put out a bogus video back in July against Rudy. Today they announced that they are back with the same stale arguments against America’s Mayor. In the first 13 minute video the IAFF released in July, the union leaders claimed that Rudy dropped the ball after the first World Trade Center attack in 1993. Sadly, it was later pointed out that Rudy was not the Mayor of New York City in 1993. Now, the IAFF leadership is back with a vengeance. This time New York Fire Chief Jim Riches is leading the charge. He appeared in the IAFF attack ad back in July. Hillary Clinton is welcomed by IAFF President Harold Shaitberger to the IAFF Convention in 2007. President Schaitberger was the national co-chair of the Kerry for President Committee and the most important non-politician in the Kerry leadership. 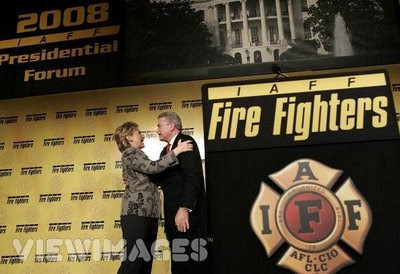 Hillary Clinton and “good friend” IAFF President Harold Schaitberger. Hillary and Harold are so close, in fact, that the IAFF President, Harold Schaitberger, introduced his “good friend” at the Democratic Leadership Council event in July 2002 and has dined with her and spent time with her at her Washington home! UPDATE: You must read 911 Families for a Safe and Strong America to get the truth about these lies against Rudy. – The walkie-talkies used on 9-11 were the old ones. – The FDNY uses the radios Rudy ordered- today. – There are still no radios currently in existence that will overcome all the obstacles and atmospheric conditions that detract from communications while operating in high-rise towers.